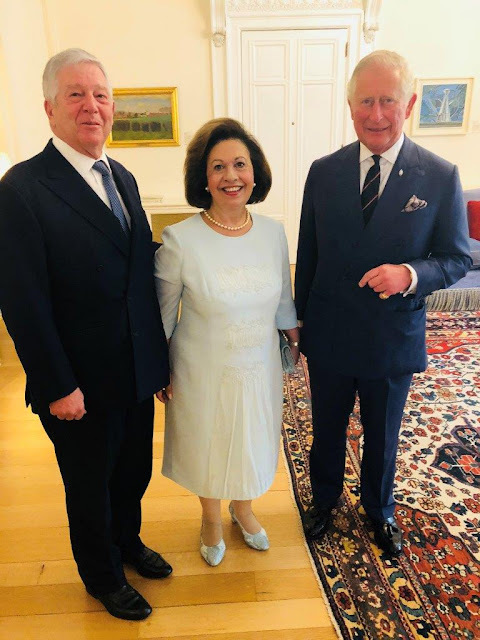 Earlier today, the Prince of Wales and Duchess of Cornwall were the guests of honor at the British Embassy at a reception hosted by British Ambassador Kate Smith, CMG, where the guests included Crown Prince Alexander of Serbia and his Greek-born wife, Crown Princess Katherine. The Crown Prince and Crown Princess traveled from their home in Belgrade to attend the reception. A godson of Queen Elizabeth II, the Crown Prince has his own Greek ties. His mother was born Princess Alexandra of Greece, the daughter of King Alexander I and Aspasia Manos. Alexandra was born posthumously, five months after the death of her father. Earlier in the day, the British Ambassador hosted a private meeting with the Prince of Wales and the Duchess of Cornwall and King Constantine II and Queen Anne-Marie of the Hellenes, two of their sons, Crown Prince Pavlos and Prince Nikolaos, who was accompanied by his wife, Princess Tatiana. King Constantine II and Queen Anne Marie returned to live in Greece in 2013. They live in a villa in Porto Heli. Prince Nikolaos and Princess Tatiana live in Athens. The private meeting lasted for about an hour and included tea. King Constantine II and Queen Alexandra of Yugoslavia (Crown Prince Alexander's mother) were first cousins. Prince Philip, Duke of Edinburgh, who was born at Mon Repos on Corfu, in June 1921, is a first cousin to Constantine II's father, King Paul, whose father, King Constantine I, was an elder brother of Prince Andrew of Greece and Denmark. King Constantine and Queen Anne Marie, the youngest sister of Queen Margrethe II, are close to their British cousins. They lived in London for many years. Their two eldest children, Princess Alexia and Crown Prince Pavlos, held their weddings in London. Both weddings were attended by Queen Elizabeth II and other members of the British Royal family. The King's 60th birthday party was hosted by the Prince of Wales at Highgrove. The Queen is one of the godmothers of Constantine II's younger daughter, Princess Theodora, while the Prince of Wales is a godfather to Crown Prince Pavlos. The late Diana, Princess of Wales was a godmother of the King's youngest child, Prince Philippos. King Constantine is one of the Duke of Cambridge's godparents. The Duke is a godfather to Crown Prince Pavlos's second child and eldest son, Prince Konstantine-Alexios, now a student at Georgetown University. The Greek monarchy ended with a plebiscite in 1974, although Constantine II and his family went into exile in December 1967, following a failed counter-coup against the military junta that had seized control in April of that year. Crown Prince Alexander's godmother is Queen Elizabeth II. The Queen's father, King George VI, served as a witness at the wedding of Alexander's grandparents, King Alexander I and Princess Marie of Romania and was also King Peter's godfather. Although the Prince of Wales has made several private visits to Greece, this was his first official visit to Greece. In reality, do you think ANY of the former monarchies in Europe will be restored? I know several of the families have said publicly either that they are advocating for that or that they stand ready & willing to serve should the people request it. Just curious as to your thoughts, especially because in documentaries from many years ago it was clear that Constantine was hopeful for this.